Data in a directory is structured hierarchically in a tree pattern consisting of nodes, leaf nodes, and links between the nodes, as shown in the following illustration. This is useful in application development to model, store, and quickly traverse hierarchical data. 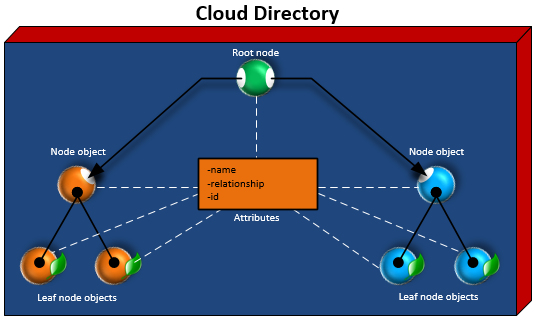 The root is the top node in a directory that is used to organize the parent and child nodes in the hierarchy. This is similar to how folders in a file system can contain subfolders and files. A node represents an object that can have child objects. For example, a node can logically represent a group of managers whereby various user objects are the children, or leaf nodes. A node object can only have one parent. A leaf node represents an object with no children that may or may not be directly connected to a parent node. For example, a user or device object. A leaf node object can have multiple parents. While leaf node objects are not required to be connected to a parent node, it is strongly recommended that you do so, since without a path from the root, the object can only be accessed by it’s NodeId. If you misplace the id of such an Object, you will have no way to locate it again. The connection between one node and another. Cloud Directory supports a variety of link types between nodes, including parent-child links, policy links, and index attribute links.